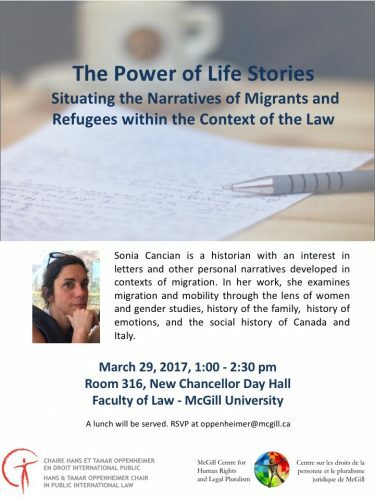 The Oppenheimer Chair and the McGill Centre for Human Rights and Legal Pluralism are pleased to welcome Dr. Sonia Cancian, from Zayed University for a seminar on life stories of migrants and refugees and the law. This seminar will lead a discussion on life stories of migrants and refugees and their power (or not) within the world of policy-making and the law. Dr. Sonia Cancian is a historian with an interest in letters and other personal narratives developed in contexts of migration. In her work, she examines migration and mobility through the lens of women and gender studies, history of the family, history of emotions, and the social history of Canada and Italy. 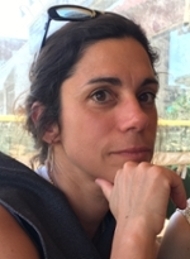 She is the author of numerous publications including her first book, Families, Lovers, and their Letters : Italian Postwar Migration to Canada (2010). Her new research focuses on the lives of migrant and refugee war orphans in Italy and South Africa, 1945-2015.